Improving infrastructure and basic services is a central task in the region’s growth and development agenda. Despite the importance of private sector participation, governments will continue to play a defining role in planning, financing, executing, and overseeing key infrastructure projects and service delivery. This reality puts a premium on the efficient and transparent management of public investment, especially in light of the considerable technical, administrative, and political challenges and vulnerability to corruption and rent-seeking associated with large public works. The recent spate of corruption scandals surrounding public procurement and infrastructure projects in the region underscores the urgency of this agenda. 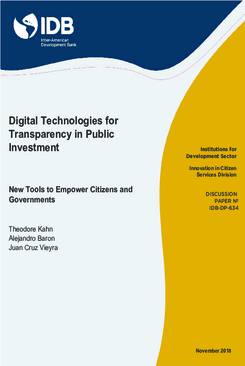 The emergence of new digital technologies offers powerful tools for governments and citizens in the region to improve the transparency and efficiency of public investment. This paper examines the challenges of building transparent public investment management systems, both conceptually and in the specific case of Latin America and the Caribbean, and highlights how a suite of new technological tools can improve the implementation of infrastructure projects and public services. The discussion is informed by the experience of the Inter-American Development Bank in designing and implementing the MapaInversiones platform. The paper concludes with several concrete policy recommendations for the region.